Abed Elzohby, his wife Sakina and their four young children aged 8, 11, 13 and 14 fled Syria two and a half years ago and made a home for themselves in West Belfast. 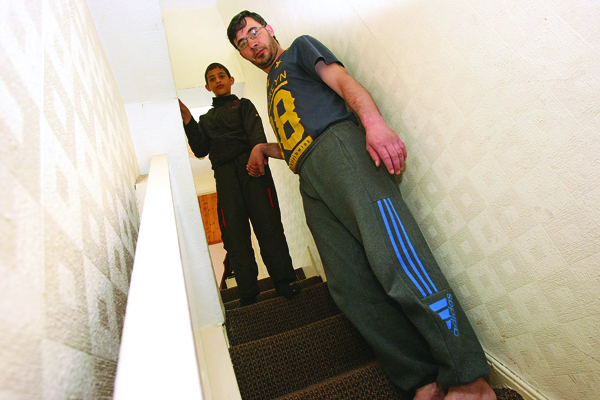 The Elzohby family were among the first batch of Syrian families to arrive in Belfast on December 15, 2015 when they were housed in Earlscourt Street, a home which they say is in a state of advanced disrepair. Rotting door frames, mould and slugs are all daily features in their home. As well as this Mrs Elzohby and her children have had multiple falls on the steep stairs. Speaking to the Andersonstown News in their Earlscourt Street home through a translator Mr Elzohby said: “We were promised before we were brought here that we would be given a dignified life in a safe place. “This is a lovely community with wonderful people but this house is not good. We were told this was a temporary house for three months, my wife signed a contract but no-one explained what was in it, she didn’t understand. “The sheets and the bedding were filthy, the smell is bad, the door frames are rotting, some have been filled with Blue Tack. “The stairs caused my wife to fall many times, she has miscarried three times I believe as a result of falling, all of my kids have also fallen on the stairs. My youngest baby is always coughing because of the dampness. This house is so damp that we have had to keep our clothes in suitcases for the past two and a half years. Mr Elzohby says as well as the many health and safety problems in the property the house is also too small. Elfie Seymour of Participation and the Practice of Rights said: “This family are only one of thousands on the waiting list in West Belfast and are indicative of the housing crisis felt here and other areas of the city. The response to this crisis from the state and its actors in the DfC, Belfast City Council Planning Dept and Housing Executive is extremely poor and lack the political will and determination needed by the families who have been waiting for years. “The solution is on our doorstep, in March 2015 families in the Equality Can’t Wait group went out in Belfast taking pictures of vacant land sites in their communities which could be used to tackle the housing crisis.